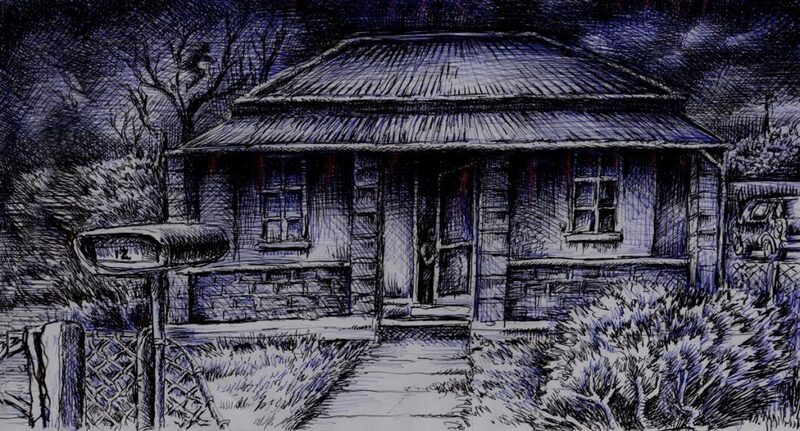 Black Mountain has its fair share of haunted buildings and items but what most people won’t realize is that most of my stories are inspired by my own experiences and that of my family and friends. While most will perceive these things as fiction I write off experience and fact. Another occasion was hearing someone walk down the passageway at night but they would drag their one foot, my mom on many incidents would wake to find something in her room or sitting at the edge of her bed. As if a warning of some kind. Then not long after the phone would ring and the news would be that someone had died. My mom in my later years told me about so many of her experiences that all of you will have the pleasure of experiencing within the Black Mountain universe. I asked my mom a few days back what she most remembered from our old house. She told me that while they were moving in, the previous owners warned my parents that a woman could be seen on most nights in the back of the house and she had scared them on many occasions. My parents thought it was nothing more that sour grapes, as they had to move out of the home so they were trying to scare them… Clearly they were warning them. She recalled experiencing the exact same thing I did, one night after cleaning up she made her way through from the kitchen to the passageway. She shut the door and while walking up the passageway the doorknob rattled, she turned as it rattled again. The door swung open as she was walking towards it, my mom turned and ran to her bedroom. The next day she found the key for the door and from then on out the door was locked at night. When it came to the passage light she explained that if it was off she would hear all kinds of things walking up and down it. She never told us as children because she did not want to scare us. My dad worked for the railway and when he came home from work he used to rest his cap on a railing by the door and every morning it would be on the floor. The smaller things like that once all connected together paint a much more sinister picture. One story that got me was when my sister Antoinette cried as a child because she kept saying strings were coming out of the ceiling and trying to eat her dolls hair. My eldest sister awoke one night with a tall dark figure standing over her, she described it as having some kind of turban on its head but the turban was pointy. She screamed as she felt she could not breath and to this day insists it was choking her. Some people will quickly say oh it’s nothing more than sleep paralysis but she had actual marks on her neck by the time my parents ran into the room. Was it the sheets that possibly made the marks as she struggled to get away from something she was dreaming off? This is what most would say, or that she was suffering from sleep paralysis. Another sister while heavily pregnant was lying on her bed in her room and was dozing off when she awoke to find her wardrobe door ajar, she thought she was imaging things when a pair of red eyes peered at her from within. That was more than twenty-one years ago and she still speaks of how its eyes looked like two burning pieces of coal. The same sister one night awoke to find her blankets had been pulled off of her bed, she looked under the bed to find a tiny film of dust had not been disturbed except for where the blanket was pulled under. 12th Avenue was my childhood home with many wonderful memories but looking back the supernatural occurrences were plentiful. Another thing is the haunting of homes and even objects is one thing but most of the time it’s actually the people themselves that are being haunted. But this we will reflect on another time…. Remember… sometimes it’s best not to investigate those things that go bump in the night. There is an Ouija Board that resides in Black Mountain, it is one of a kind. The person who crafted it may be unknown… for now… But it wields an incredible pull to the spirit world and more so to the dark side. Although Black Mountains Ouija is nothing more than a portal for demons the real Ouija is a different story. Well… mostly. 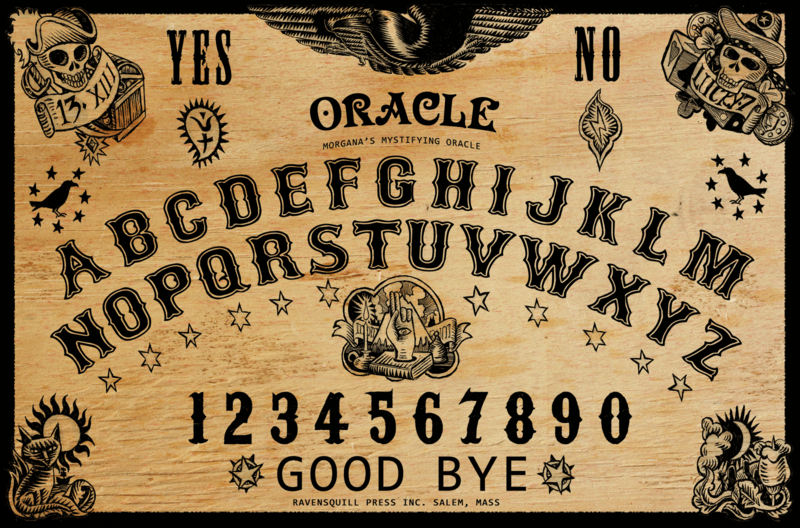 Charles Kennard claimed he learned the name “Ouija” from using the board and that it was an ancient Egyptian word meaning “good luck.” Although in actual fact the word Yes in French is “Oui” and yes in German is “Ja”. But if one searches there are many tales of how the name came about. The Ouija board also comes with many names from a witchboard to a talking board, in South Africa they call it glassy glassy and the game is used with a piece of glass instead of a planchette. Everyone knows some form of story about someone that used the board and had something horrendous happen to them. Most of these would be nothing more than an urban legend, but I believe where there is smoke there is fire. Ouija boards were first advertised around 1891 coming from a toy and novelty shop, yes that is correct. They were easily accessible to adults and children alike with the hook that this magical device could answer questions be it from the past, present or the future. It promised the most accurate answers one could wish for. Most people were not concerned that they were communicating with the dead, they did not think of what the consequences could be for contacting something otherworldly. Most people looked at it with curiosity and couldn’t wait to make contact. The churches were quick to warn about demonic possession but a lot of people did not seem to care. I used an Ouija board growing up as I’m sure a lot of you have as well. I had no idea what I was doing but the hook was could you actually communicate with the dead, a spirit and what happened if something more ghastly came through like a demon. All these factors played in my mind but still I found myself sitting on a Saturday afternoon with my friends asking if anything would like to communicate with us. The Ouija did find itself being accused of being nothing more than a devil board by many that did not understand it, but in the same breath who really knew what was going to be summoned when you placed your fingers onto the planchette and called out for contact. Many evil stories have been linked to it over the years but I have also found that psychics and mediums have used these boards with great success. Some swear by them to help find missing people or even to help them write novels and poetry. One man said that without the help of the Ouija he would have died as it warned him that he had bowel cancer and after a trip to the doctors it was confirmed. So what actually moves the planchette, is it a spirit, a demon trying to trick you into believing it’s a loved one? There again are many conflicting answers, I believe it is a supernatural force as I have experienced its work first hand. But some say there are those that fake it, even just to joke or tease their friends where in the older times they would appoint someone to guide the planchette during a séance to either trick the mourning person out of money or material possessions. What do you think about the Ouija Board? Do you believe it is a supernatural force at work or is it possibly ones own mind involuntarily pushing the planchette? Someone asked me today, why are there so many ravens on the island? 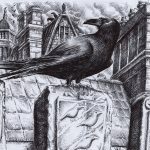 Is there a special meaning for the raven? If you look up the description of the raven it is simply a large heavily built crow with mainly black plumage, feeding chiefly on carrion. But if you delve a little deeper into the more spiritual or occult side of things the raven is so much more than just a bird…. In Greek mythology ravens are associated with Apollo, the god of prophecy. Depicted as an oracular bird bringing messages from the other side, typically associated with the supernatural realms lying beyond the ordinary experience. A Greco-Roman legend says ravens were once all white but because they could not keep secrets Apollo punished them by scorching their beautiful white feathers black. In Christian lore Noah sent out a raven first to confirm the decreasing floodwater, but when it never returned it is said that God turned its feathers black for its failure. In ancient times pagan legends resulted in the demonization of crows and ravens, which were consequently depicted as familiars of witches. The raven is depicted as an ill omen before a battle or war. In Native tribes the raven is depicted as a cunning trickster but also as a sage. In Native American tribes the raven is the bearer of magic. Other Native North American tribes saw the raven as the bringer of light. When there were rituals for clarity, ravens would be called although most considered them tricksters because of their transforming/changing attributes. The raven is often heard to cackle utterances that sound like “cras, cras.” The actual word cras is tomorrow in Latin. In Norse mythology the God Odin depended on two ravens as they flew all over the world and brought back information to him, he had many daughters known as Valkyries who could transform into ravens. In Africa the raven is considered a guide, in China and Japan it is a symbol of the sun. Some cultures believe that a raven is a omen of impending death. 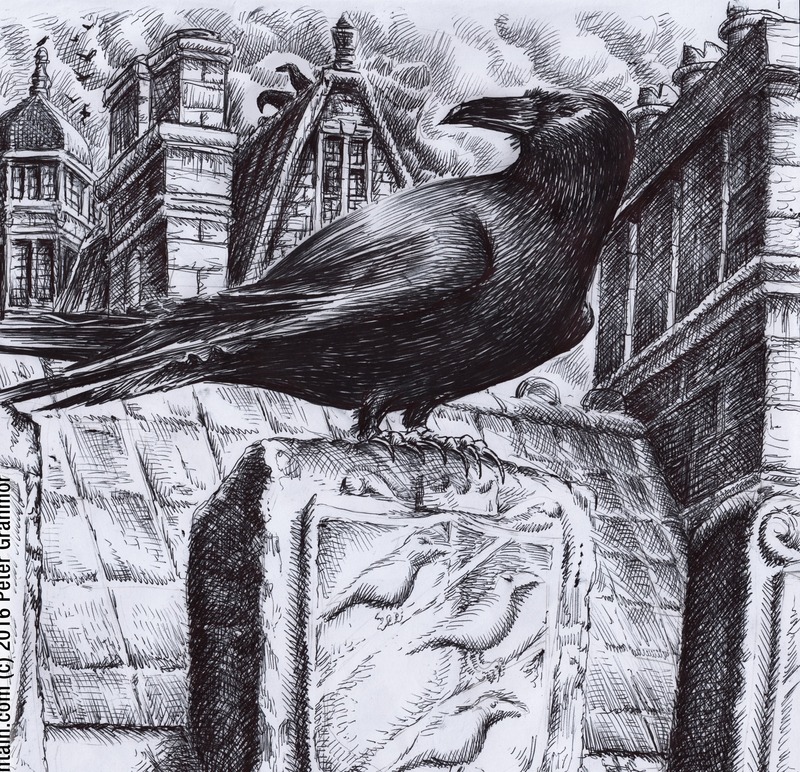 Ravens have resided in the Tower of London for centuries, English myth and legend states that the Kingdom of England will fall if the ravens are removed from the tower. Ravens in dreams are bad, they represent betrayal,disharmony and misfortune. The spiritual meaning of ravens depending on where you look could show that magical forces are presenting them self to you. Ravens are highly intelligent and good at puzzle solving, they collect shiny objects as if they were their divination tools. They learn quickly and can hold a grudge. With wings black as night ravens could be coming to you with a message or a warning, a blessing or a curse. Dr. Carl Jung deemed raven symbolism to represent the shadow self, or the dark side of the psyche… What about the ravens on Black Mountain island? I suppose you will just have to wait and see if they are friend or foe. The garments were invented by Charles de L’Orme in 1619. First used in Paris but later spread to be used throughout of Europe, the Plague Doctors costume was the most powerful symbol of the Black Death and if one was coming to see you it would be a sign of your own impending death. The Plague Doctor was a medical physician who treated those who had the plague. 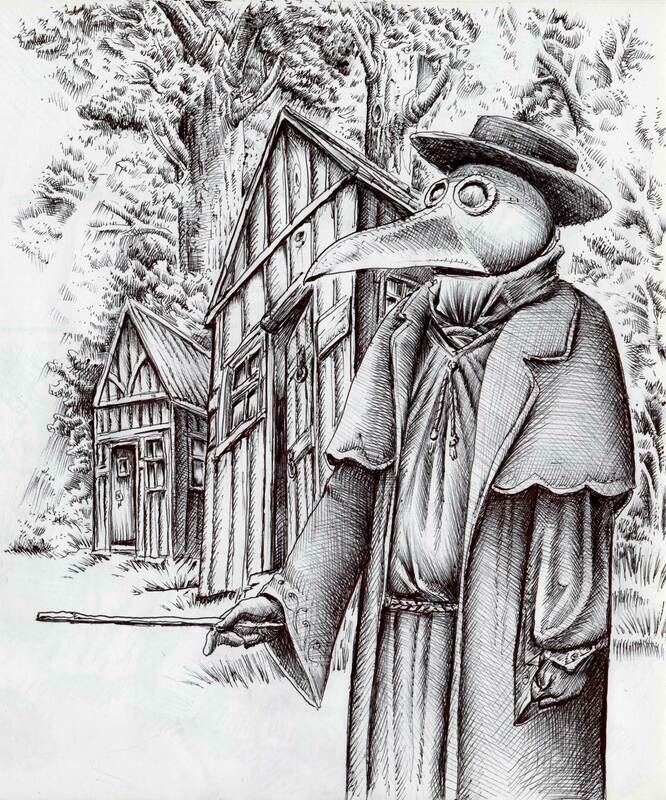 In times of epidemics towns would hire them if they had many plague victims, the fact that the town had paid would allow the Plague Doctors to see to the rich and the poor. Some Plague Doctors were con artists as they would charge families extra for fake cures and promise special treatments, these charlatans were not normally professionally trained or experienced. They would be second rate doctors unable to find success in the field themselves or young physicians trying to establish themselves. The protective suit modelled after a soldier’s armour had a heavy fabric overcoat that was waxed, a beak like cone nose to hold scented substances and straw, a mask with glass eye openings. Made of a canvas the outer garments were coated in wax, as well as waxed leather pants, gloves, boots and hat, the costume was nightmarish from the neck up. The mask and dark leather hood were held onto the face with leather bands and gathered tightly at the neck so as to not let in any noxious, plague-causing miasmas that would potentially kill the bearer. Eye holes were cut into the leather and then fitted with glass domes. The straw that was placed in the beak like cone was believed to filter the “bad air” and the wooden cane that they carried was to examine the patient without actually having to touch them, used to lift bed sheets take the patients pulse or clothes and even used for repenting sins as most people had believed that the plague was a punishment and they would ask to be whipped to repent for their sins. The aromas from the beak could have been camphor, floral concoctions, mint, cloves, myrrh and basically anything that smelled nice and strong. In some French versions of the costume compounds were actually set to smoulder from the beak like cone. Their principle task was to treat and help cure plague victims and even though some really did try most did a more actuarial job than medical, they kept track of the number of casualties and recorded the deaths in log books. They would assist or conduct autopsies themselves to determine what role the plague played which were otherwise generally forbidden in Medieval Europe. Plague doctors also gave advice to their patients about their conduct before death and they were held in high regard and sometimes even kidnapped for ransom. Pope Clement VI hired several extra plague doctors during the Black Death plague. They were to attend to the sick people of Avignon. Of eighteen doctors in Venice, only one was left by 1348: five had died of the plague, and twelve were missing and may have fled. The method that Plague Doctors used varied but Plague doctors practiced bloodletting and other remedies such as putting frogs or leeches on the buboes to “rebalance the humors” as a normal routine. The Plague Doctor is frightful and to think how afraid people must have been when they would come to their homes. How would you feel if you had taken ill and he was standing at your front door ready to examine you?